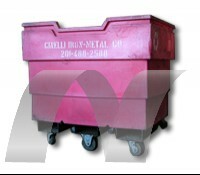 Description: The new Poly-Trux® 50P-16S Scrapasaurus recycling collection cart makes handling scrap metal, paper, glass, plastic and other materials safe and simple. With three steel fork tubes designed into the base, the innovative scrap collection cart can be safely and easily picked up and transported by a forklift and rotated until it’s completely upside down for emptying into a roll-off, Gaylord, trailer, baler or other container. For scrap metal yards and those offering door trade services, the rugged 50P-16S Scrapasaurus minimizes the need for manual scrap handling for a safer, smoother operation that also processes faster. Instead of carrying heavy, unwieldy piping, wire, appliances and other scrap onto a scale and then lifting and hauling them onto a scrap heap, the clever cart allows your customers to roll it to their vehicles, unload the scrap directly into the cart, roll it onto the scale and collect their payment.